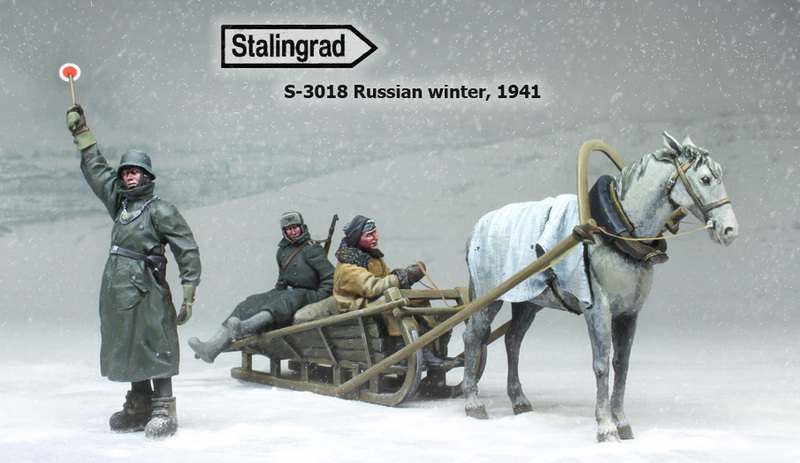 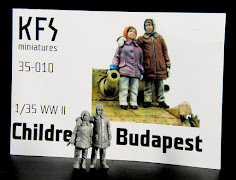 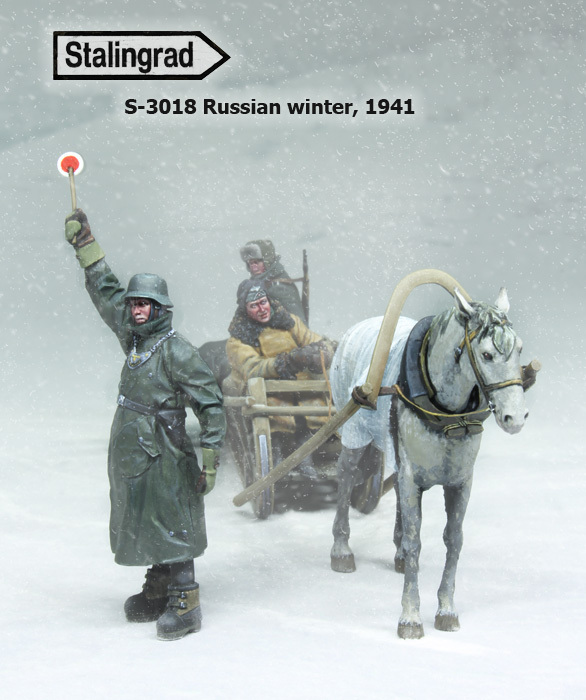 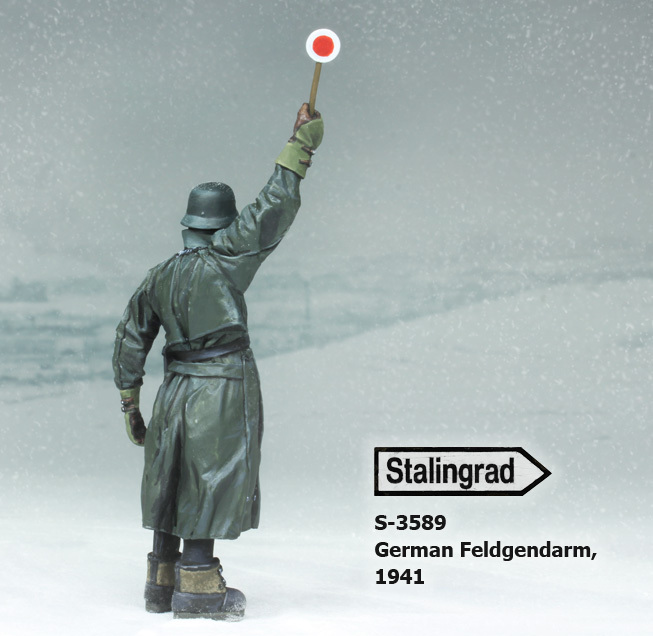 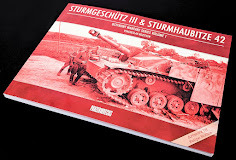 Stalingrad Miniatures has a new set of 1/35th scale figures available on the market, this mix of a horse and cart and two passengers are being directed by a military policeman (Feldgendarm) in what looks to be the cold recesses of the Russian winter of WWII. 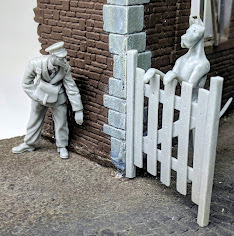 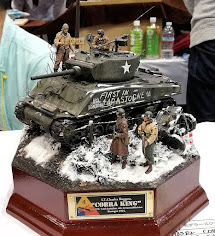 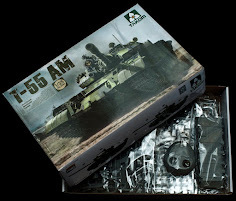 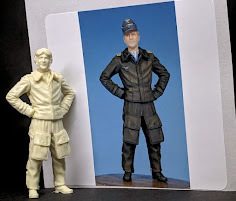 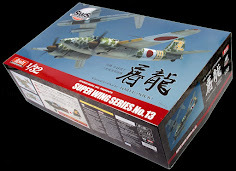 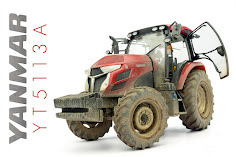 Not only do we have the images of these new resin figure, but the images of the time and place with the subjects in uncannily close looking photographs to those that are captured in 35th scale in resin by the sculptor. 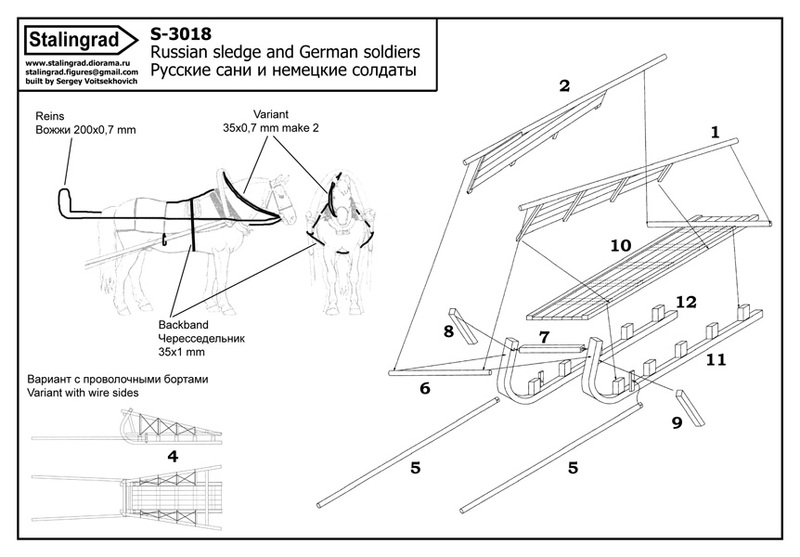 The resin sledge or "Panje" cart is seen here in the instructions how to put it together - as well as some of the horse's reins & bridle. 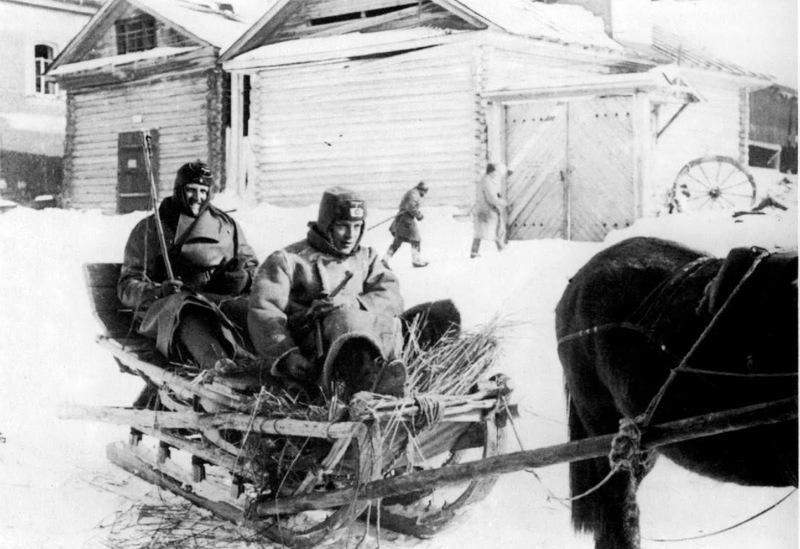 The two figures are seen inside the sledge with some supplies. 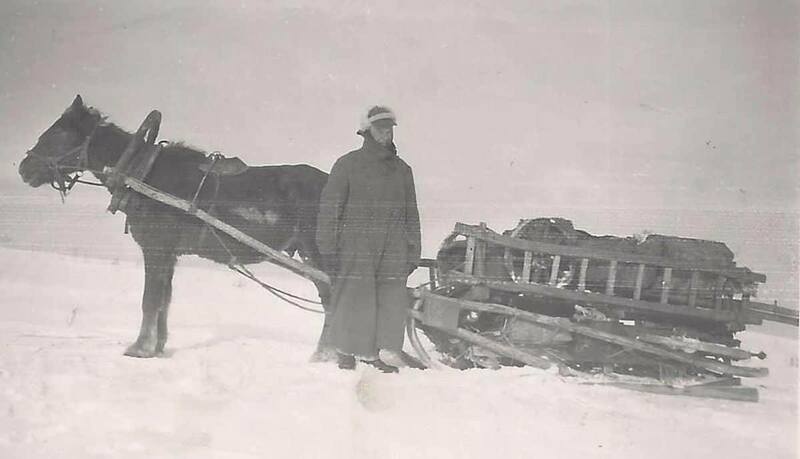 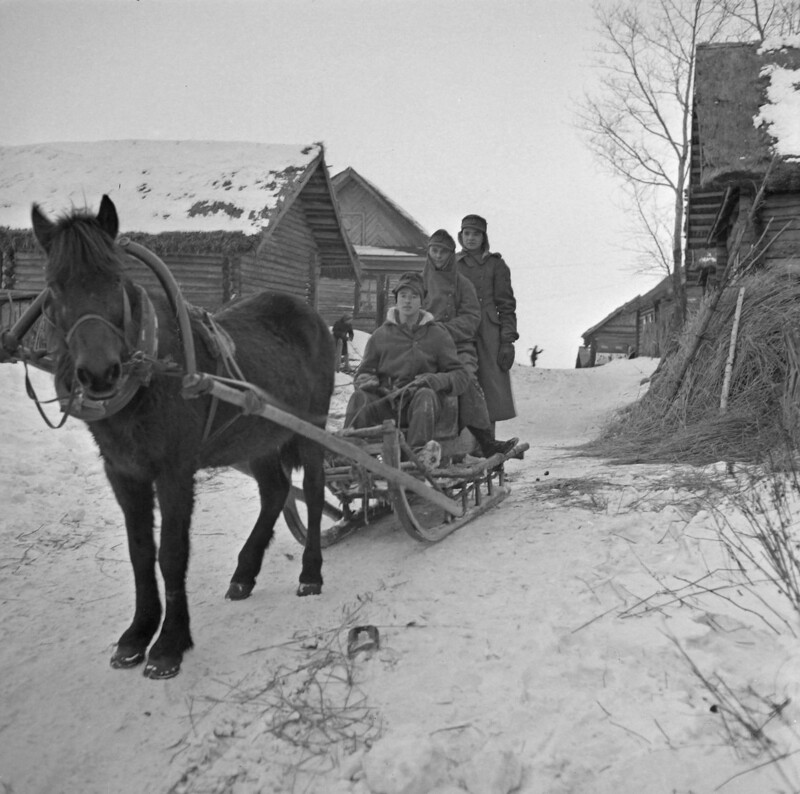 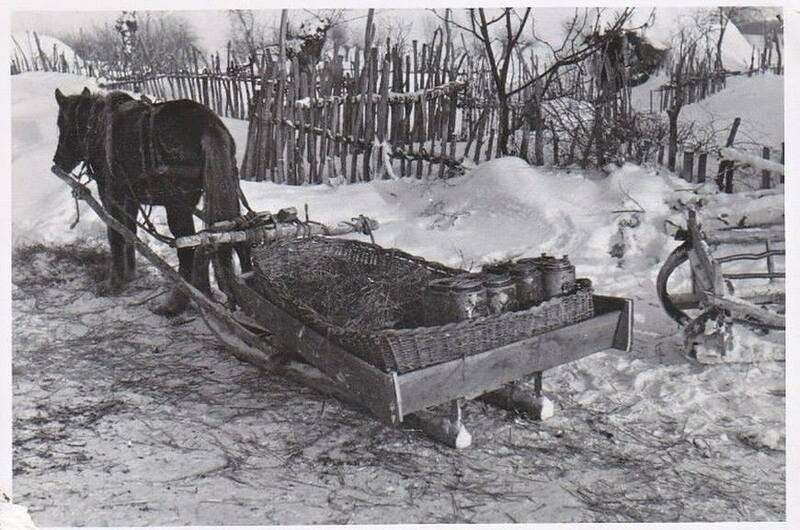 These carts were often used instead of automobiles with fuel always short and vehicles that were not used to the cold, these workhorses and sledges were invaluable and a common sight through the region and the war on both sides. You can see the German MP allowing them to cross the road, obviously a high traffic area! 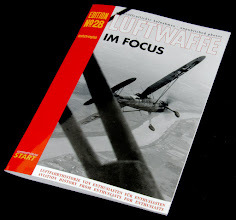 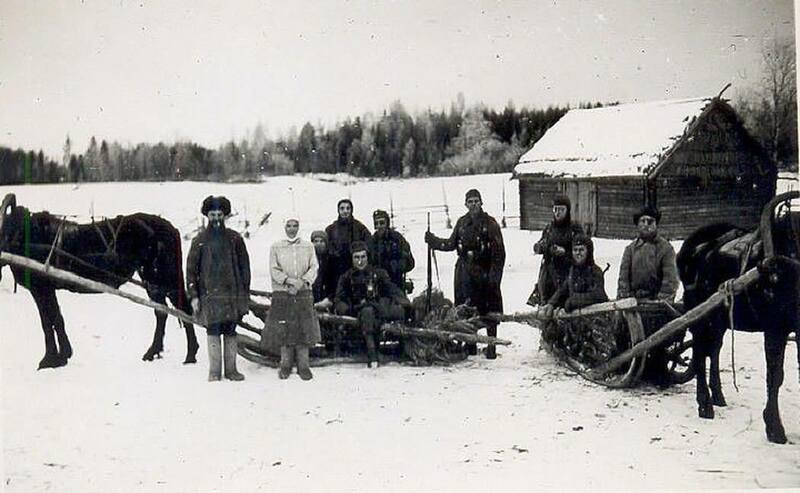 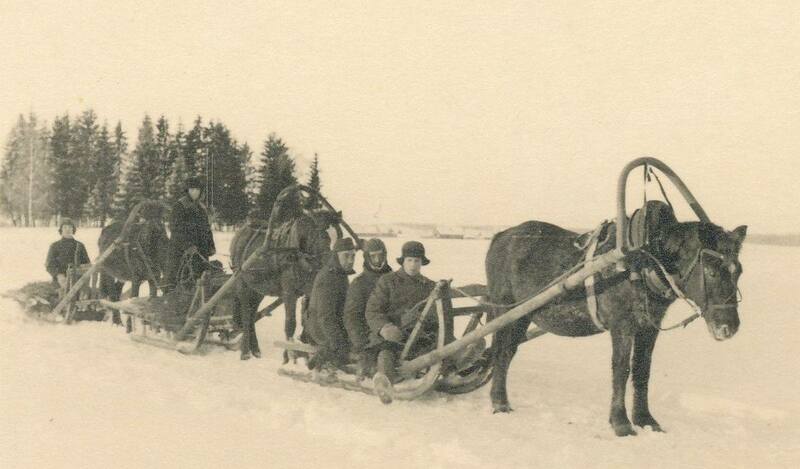 Although the Germans did make their own sledges on the "Ostfront", several were liberated from the resident population along with whatever they could use to survive. 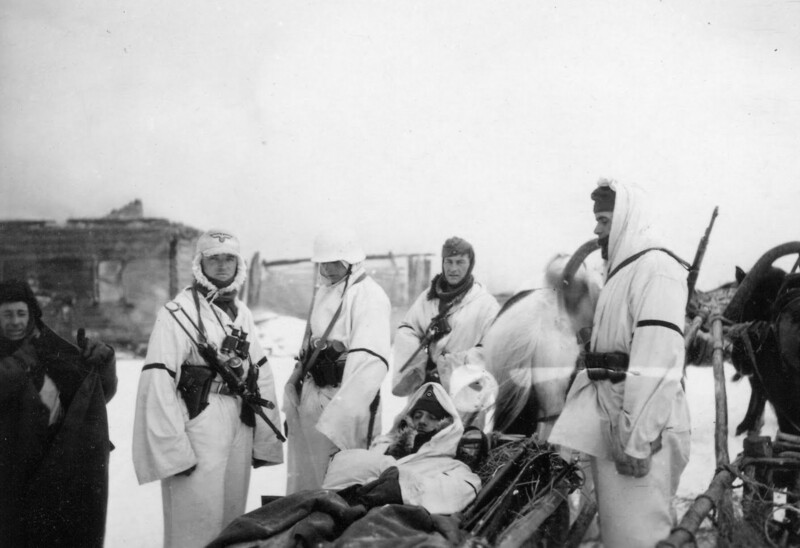 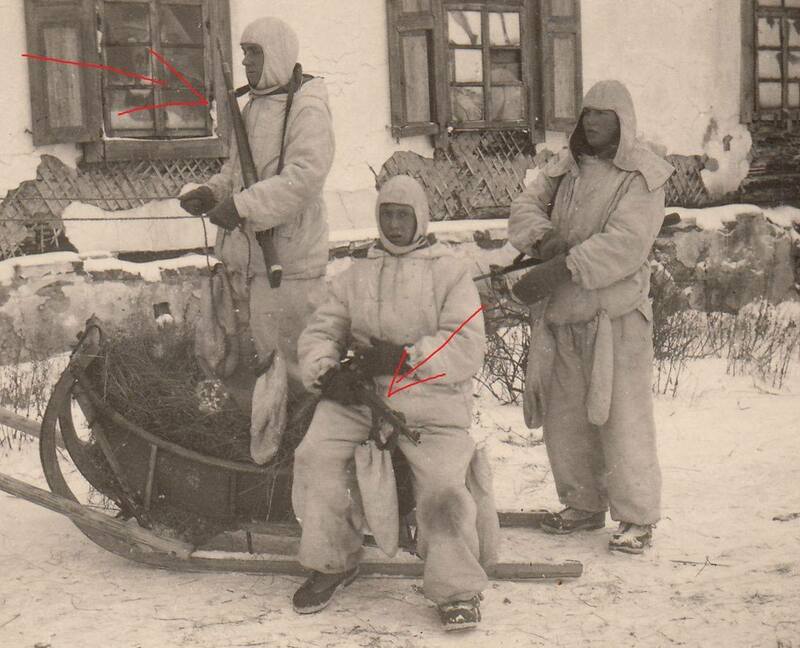 The Germans made use of specialized winter clothing like the "commissar" caps, sheepskin overcoats and thick over-boots which insulated them from the cold of the Russian winter a little better. 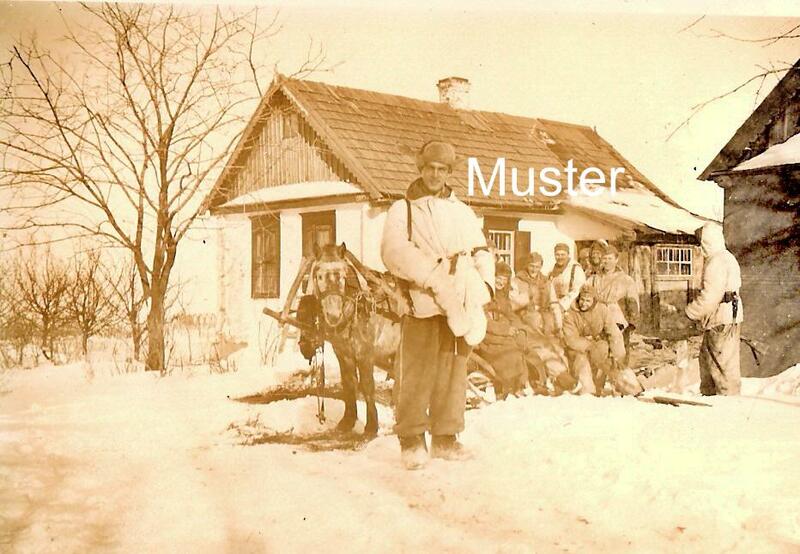 The Germans often quartered in Russian villages, but all to often found little of the home comforts they desired there, often because they were simply devoid of them , or these had already been taken by other Germans. 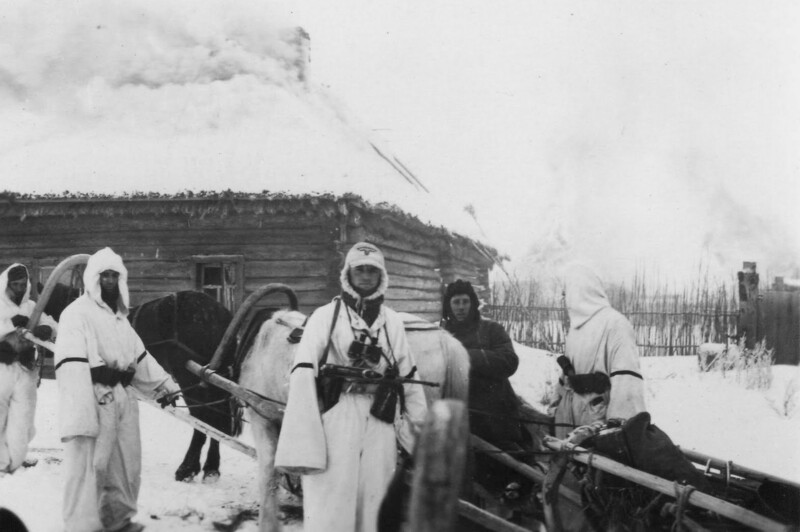 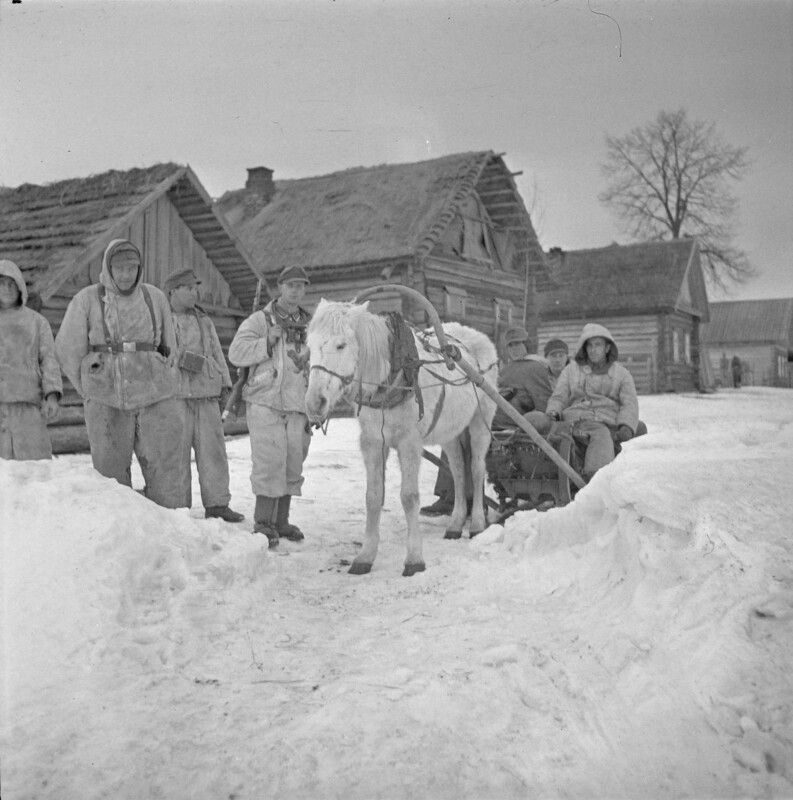 Villages became the scenes of battles during winter time so that soldiers would not be forced out into the hellish white and cold. 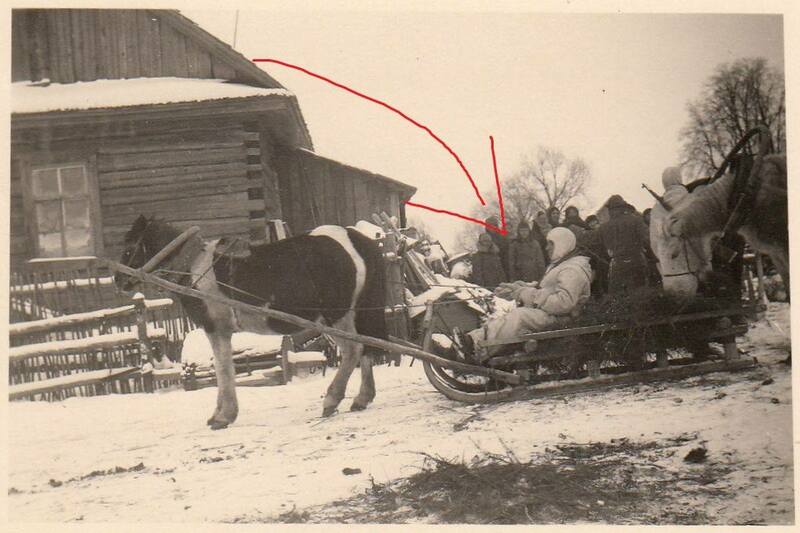 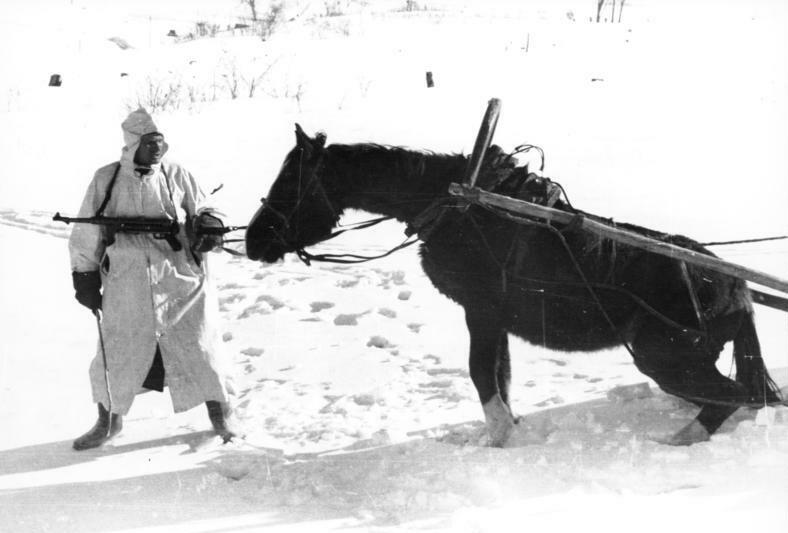 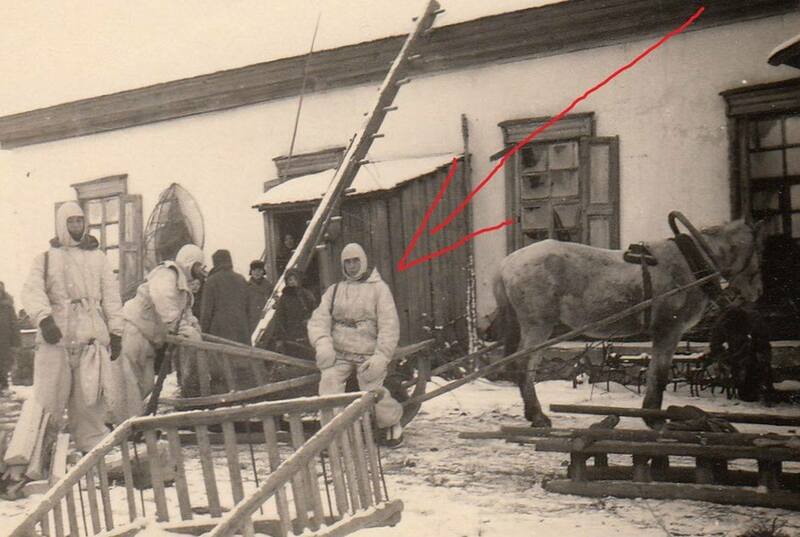 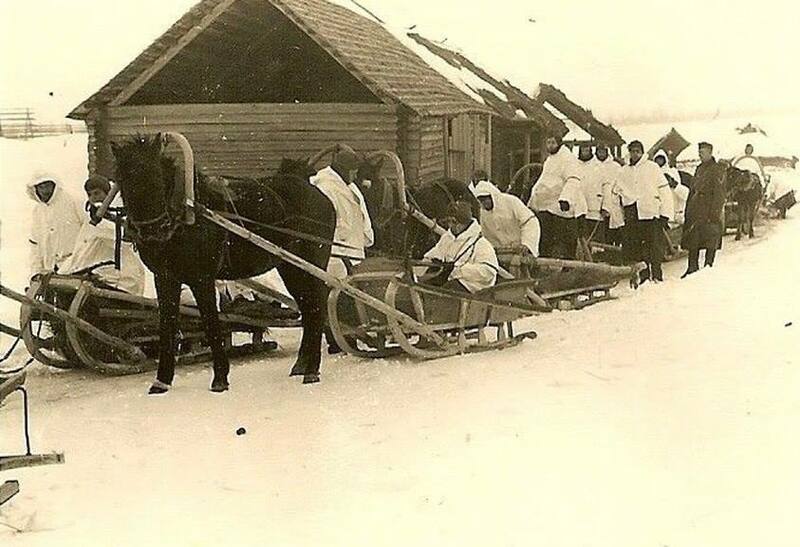 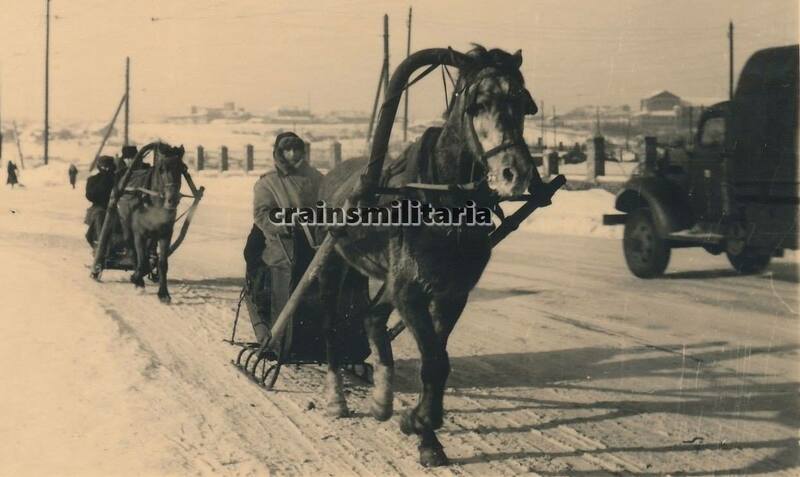 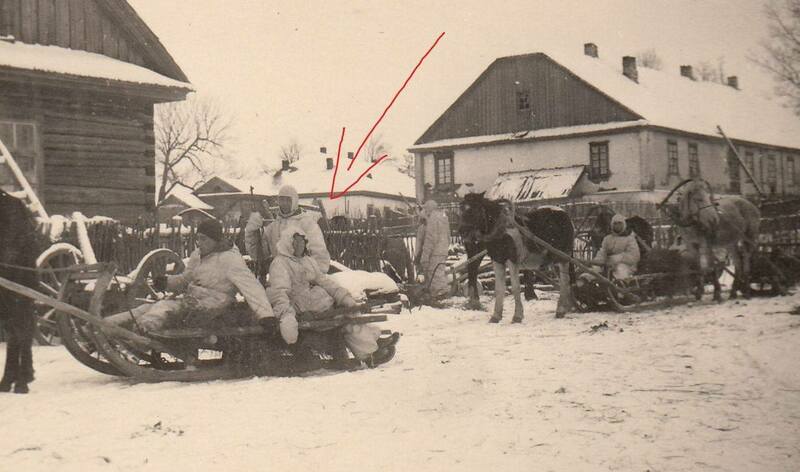 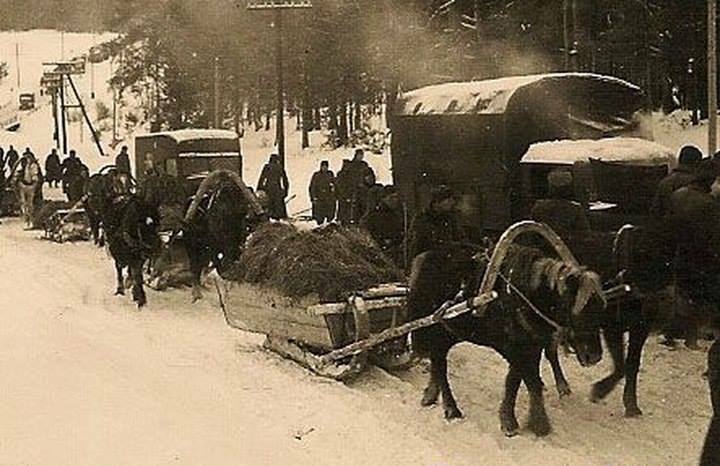 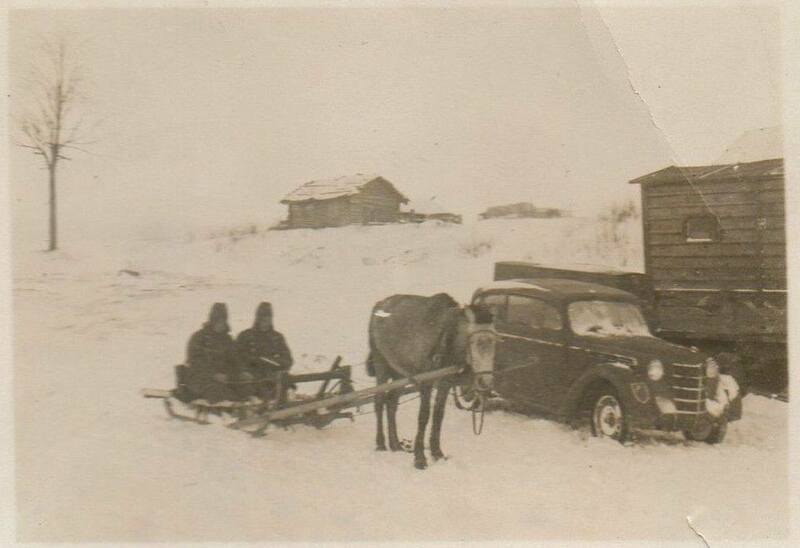 In these photos below you can see the German soldiers using captured/ stolen horses and their "Panje" sledges during wartime and anti-partizan operations in Russia During WWII. 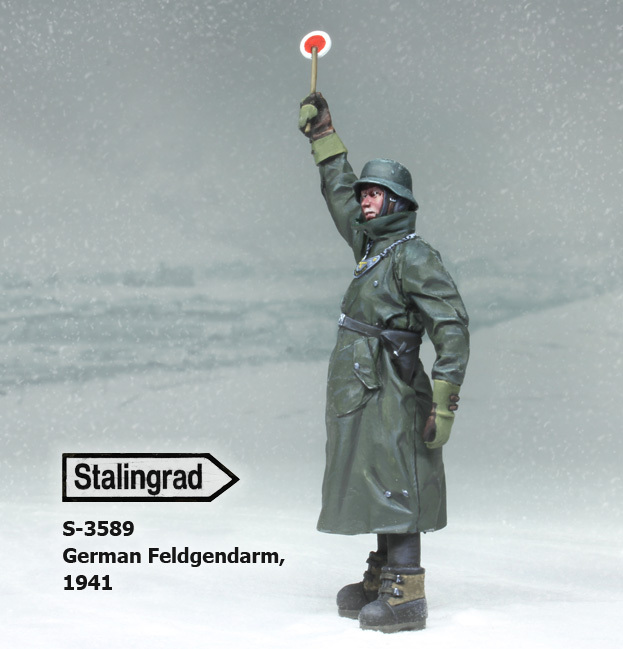 This German Military Policeman or Feldgendarm is seen doing his duty somewhere in Russia during World War Two. 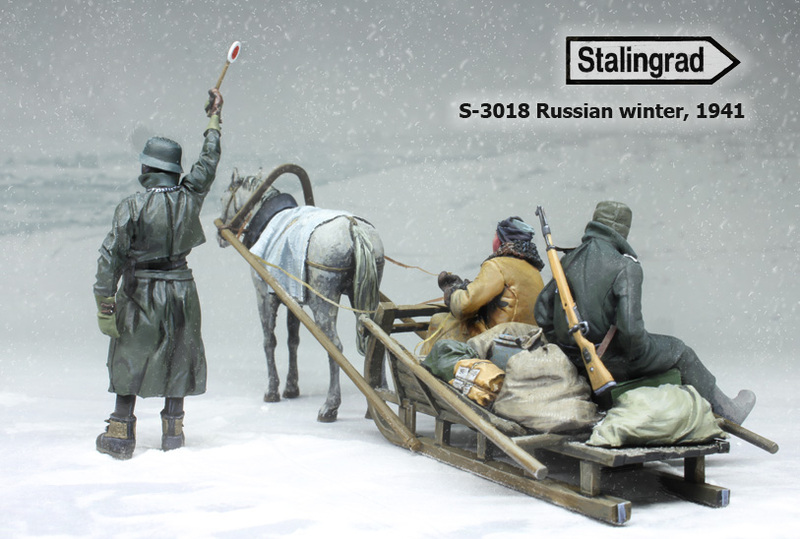 The figure, sculpted by Alexander Zelenkov and cast in light grey resin comes either by himself in this single figure package or with the set of Panje riders we have already looked at - making this an interesting scene - but the man by himself is also an interesting study. 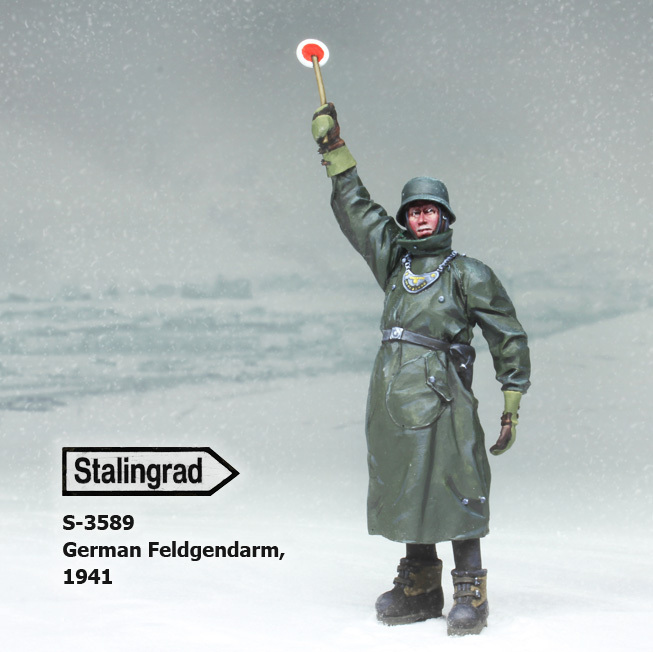 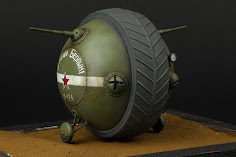 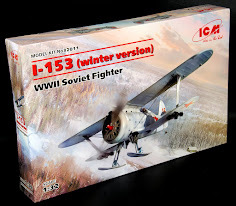 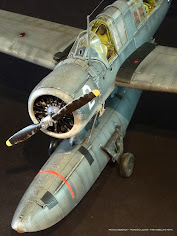 I think that the figure sculpted here most represents the picture below, that of a German Feldgendarm doing his duty somewhere in Russia in the dark and cold winters of the Eastern Front (Ostfront) in Soviet Russia. 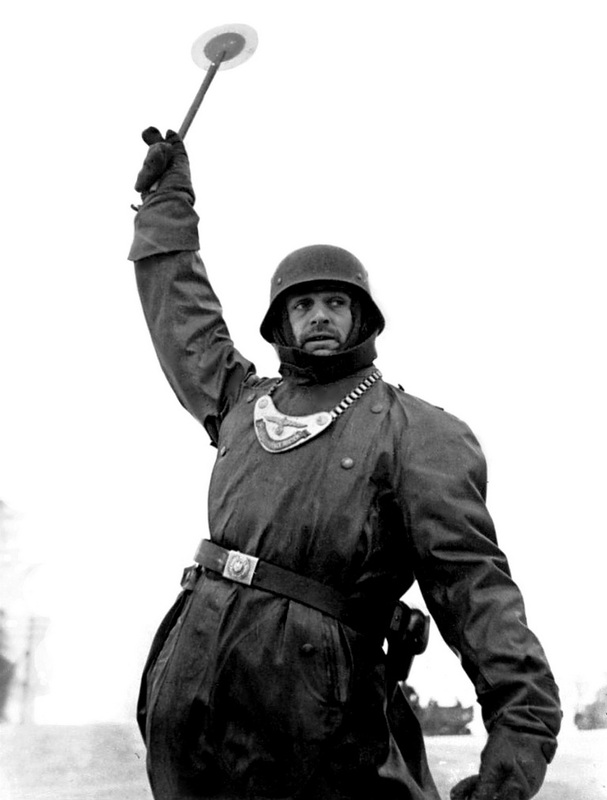 You can see he is wearing the same motorcyclists waterproof (and slush proof) coat, thick insulated gloves to keep the cold away from his bare hands, a pistol by his side in it's holster. 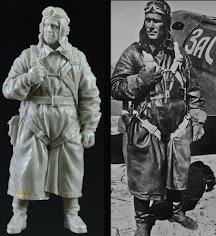 He is here, in that same pose, nice work done to capture this by the sculptor. 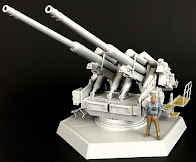 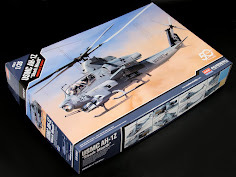 A full shot of (maybe the same?) 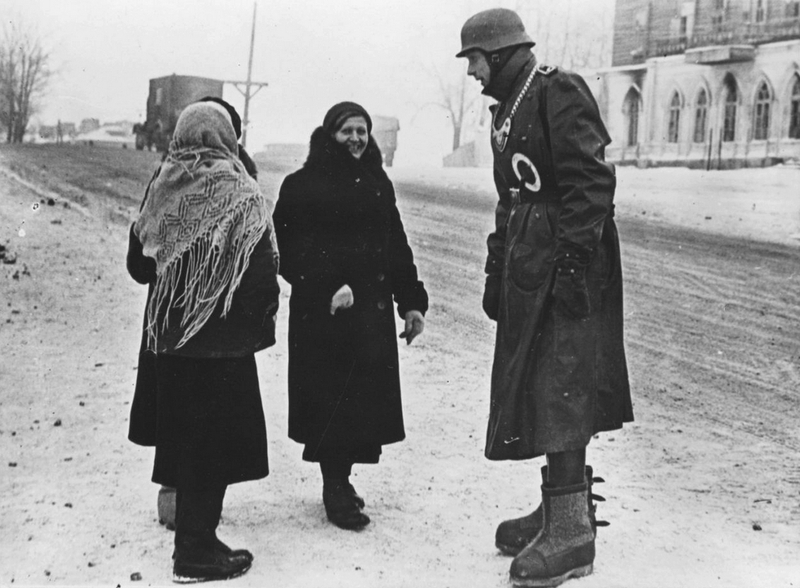 Military Policeman, here talking to some local ladies, wearing exactly the same gear - which leads me to think he is the same fellow - but the main thing to see are the thick over boots. 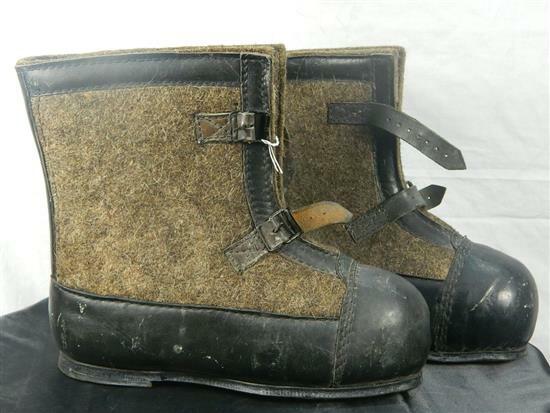 These not only gave the soldier an inch or so in height (good when talking to the ladies) but insulates the boot or shoe inside against the cold, hard ground.